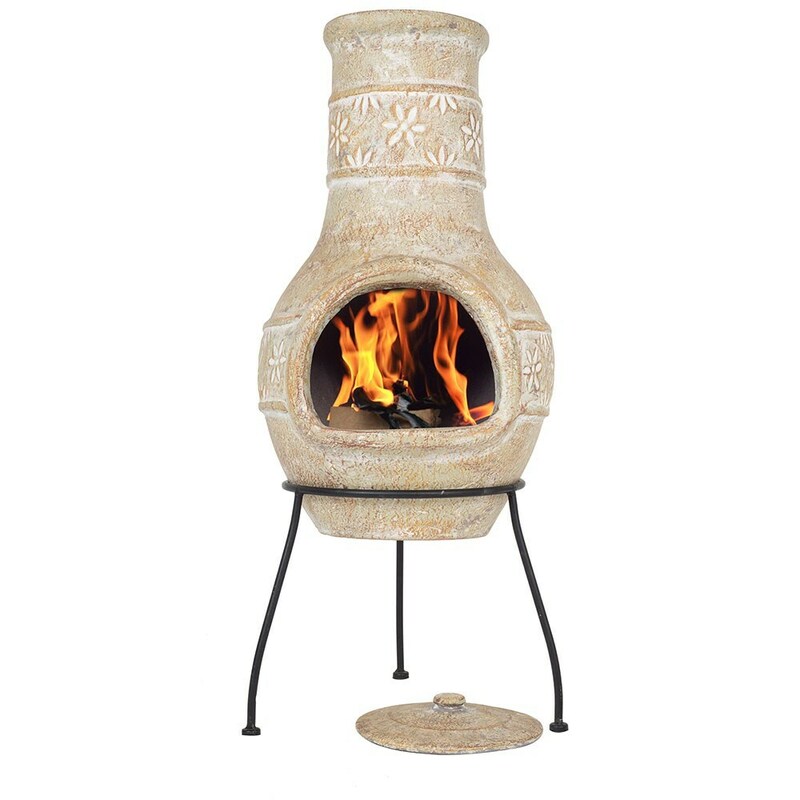 Buy Star flower medium chimenea: Enjoy campfire cosiness in the garden with this rustic traditional chimenea. Handcrafted from natural clay with a carved flower motif, the snug lid helps to reduce heat loss from the top so more is radiated from the central recess.<br><br>Throw in chunky logs, fire it up and enjoy the unmistakeable crackle and aroma of a real wood fire. Perfect for toasting marshmallows, sharing stories and songs, or simply relaxing at the end of a busy day.<br><br>Includes sturdy steel tripod stand.<br><br>Measurements:<br>Ø36cm x H85cm<br><br><b>Warning</b><br>For outdoor use only. Keep children and pets away from the brazier when lit. Always position away from buildings on a safe non-flammable surface. If using on a paved patio, place on an additional protective paving stone made from solid natural stone or concrete at least 5cm thick. This will avoid possible discolouration and cracking of your patio, as some mock slabs made from resin or ceramic may be susceptible to heat damage. Only for use with logs. Enjoy campfire cosiness in the garden with this rustic traditional chimenea. Handcrafted from natural clay with a carved flower motif, the snug lid helps to reduce heat loss from the top so more is radiated from the central recess. Throw in chunky logs, fire it up and enjoy the unmistakeable crackle and aroma of a real wood fire. Perfect for toasting marshmallows, sharing stories and songs, or simply relaxing at the end of a busy day. Includes sturdy steel tripod stand. For outdoor use only. Keep children and pets away from the brazier when lit. Always position away from buildings on a safe non-flammable surface. If using on a paved patio, place on an additional protective paving stone made from solid natural stone or concrete at least 5cm thick. This will avoid possible discolouration and cracking of your patio, as some mock slabs made from resin or ceramic may be susceptible to heat damage. Only for use with logs.